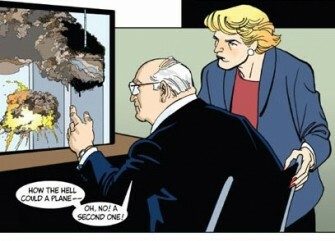 A cross-section of media reaction to the release of The 9/11 Report: A Graphic Adaptation and its on-line serialization. * Slate continues its serialization. * The creators on the Today show. * CBS News takes note. * Mark Evanier introduces the serialization to his readers; promises further discussion later. * Ethan Heitner at TomPaine.com looks to see if it's a good comic -- he doesn't seem to think so. * PW's The Beat notes leap in Amazon.com sales. * KWWL has the Eastern Iowan reaction. * Wonkette continues to kick project in the groin.